That will mark the first time any jurisdiction in the United States has taken up the issue. A California statewide initiative campaign last year failed to achieve any traction and never made it to the ballot. An Oregon statewide initiative  is aiming at the 2020 ballot, but if it makes it, that vote will take place a year and a half after the Denver vote. The group behind the initiative, Decriminalize Denver , wants to make the use and possession of psilocybin mushrooms by people 21 and over the city's "lowest law enforcement priority." 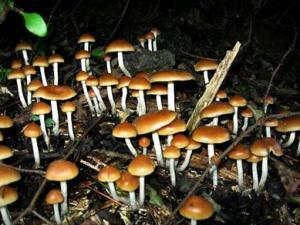 The initiative would also prevent the city from using its resources to punish adults who are caught using or possessing the mushrooms. "We're a pretty progressive city when it comes to drug policy," Decriminalize Denver director Kevin Matthews told NBC News . Still, he said he didn't foresee magic mushroom retail stores similar to pot shops "in the near future." But are magic mushrooms really so dangerous? The Global Drug Survey , with more than 120,000 participants in more than 50 countries, doesn't think so. Of the more than 12,000 people who reported taking the drug in the 2016 survey, only 0.2 percent required emergency medical treatment, a rate dramatically lower than for ecstasy, LSD, or cocaine. "Magic mushrooms are one of the safest drugs in the world," addiction psychiatrist and Global Drug Survey founder Adam Winstock told The Guardian , adding that the biggest risk was that people could pick and eat the wrong mushrooms. "Death from toxicity is almost unheard of with poisoning with more dangerous fungi being a much greater risk in terms of serious harms."